ROSEMARY’S INSPIRATION: How Big is Your Dream? My “two minute” video: How Big is Your Dream? Today’s NASA/ESA image, dated August 27, 2015, is The Hubble Space Telescope team’s updated image of the dying binary star system (the last shot was from 1997). 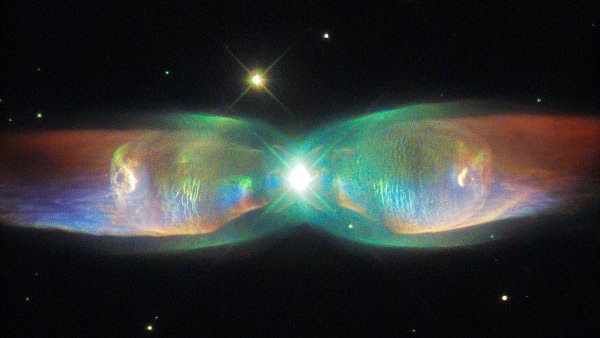 It is the Twin Jet Nebula named for the twin jets of ejecting gas unfurling like the iridescent wings of a butterfly. The seemingly magical effect stems from the stars’ unusual interaction with each other — while only one star is ejecting its outer layers, the other (an already-shrunken white dwarf) is pulling those layers in opposite directions. There is so much magic in the Universe!